Richard Kirton and a small group of us spent a rather interesting few hours with Roger Burroughs on Foulness earlier this year. 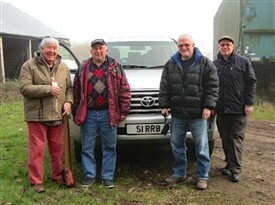 Richard has published the visit in his latest newsletter and here it is again on our RDCA site. Thank you Richard, and of course thanks also to Roger. On the right of the screen is a Google Map of Foulness. If you use the controls you can magnify the map and move about the island and perhaps even find some of the places mentioned. Churchend should be no problem to find. Near Churchend is the Foulness Heritage Centre and some of the places we visited. You can select from Map or Satellite views using the tabs at the top left of the Google Map. Pictured from left to right are Bob Stephen from the Rochford District Community Archive, Roger Burroughs, David Bailey and Barry Hale. Roger Burroughs met us at Landwick Gate at 10am on Sunday 22nd January 2017. Sporting his ‘Claas’ cap, Roger took us on a slow drive in his Toyota V8 4.5 litre Land Cruiser down the island’s main access road towards Church End. Roger is very passionate about his Toyota Land Cruiser which he bought from English cricketer Graham Alan Gooch complete with his Registration Plate, ‘H15 BAT’. Graham was a renowned international batsman who captained Essex and England. Roger later purchased his own plate, ‘SI RRB’ to reflect, jokingly, that one day he might be knighted Sir Roger Burroughs. Foulness Island has five working farms, producing wheat, barley, hay, peas and linseed. Roger Burroughs is a farm tenant of both Tree Farm at Courts End and Quay Farm at Church End. Moses Isaac Frederick Burroughs, his wife and their four sons came from Latchingdon to Foulness Island on October 12th 1945, the day that Roger was born and took on 2300 acres of Foulness farmland. His Aunt Doris, who lives in Goodmans in High Street, Great Wakering, will be 100 years old on the 2nd October 2017. Roger was a conventional farmer for 15 years, rearing 150 beef cattle, 130 sheep clones and turkeys and chickens, with Marsh, the butcher in High Street Great Wakering, being his closest customer. By 1986 he ceased farming livestock and concentrated on his arable crops which included wheat, peas and barley. Roger had the opportunity and tenacity to survive and decided to diversify and create a new business as a contractor and Haulage and Transport provider, licensed to operate vehicles under a National license for goods transport. Roger has always had a passion for heavy machinery and he needed to purchase a few items of machinery. As we drove towards Church End, Roger gave us a detailed account of the activities that he has been involved in through the years as a farmer and contractor on Foulness Island: an island which portrays the illusion of peace and tranquillity; a landscape of patchy dams and dykes dotted with fencing and vast, strange military engineering works, many lookout stations and concrete blocks; an island with an ancient granary in a severe state of disrepair along with many brick watch towers, rusting structures, glass-fronted chambers and heavy machinery. Along the route, we moved alongside many birds including Little Egrets, Heron, Partridge, Pheasant and Brent Geese and we actually felt quite at home in their presence. As we reached Church End, Roger turned left towards Quay Farm on the western side of the island. On the road, which runs from the church to Quay Farm, we passed a field on the left where four pairs of houses once stood. After the floods of 1953 and since they were built of wood and lath and plaster they never dried out and were demolished. The farm is tucked away in the north-west corner of the island, close to the River Roach and opposite Wallasea Island. The road leading down to the Quay used to be the only public right of way where the grain used to be carried and loaded onto boats. People would also catch a ferry from the Quay to and from Burnham, Wallasea Island and Potton Island. It was quicker and more convenient to go to Burnham to shop than travel to Southend. Roger created some large fields for his wheat by filling up the ditches. 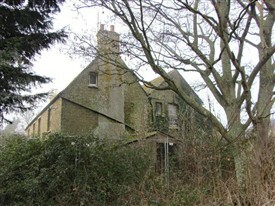 Built around 1800, the fifteen-roomed farmhouse now stands derelict and fenced off. 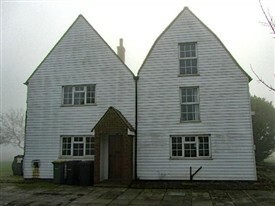 Roger took on the tenancy in 1986 and put forward a proposal to rebuild the house. There are 74 steps from the back door to the toilet and there is a dormitory on the back which was used to accommodate seasonal harvest workers whilst employed on site. In 1986 Roger celebrated his 40th birthday here along with 120 guests. Before the floods, Quay Farm was part of a community with its own Church, Public House, School, Shop and Post Office. The community had to pull together, since the island was self-contained, with access to the mainland being somewhat restricted. David Bailey sent me a 3-fold brochure depicting a potted history of Foulness and 12 of the old buildings, but was not sure where it came from, only that it is very old. It showed how small the community was at that time. The community was dealt another blow with the closing of the George and Dragon public house and then to make things worse, the village hall was demolished on 24th January 2008 because of rotten wood. It was no longer cost effective to replace it because visitors to the island had diminished because of the access rules to the island. Quay Farm is now only used for storage purposes, in fact on 30th June 1986 the tanker MV Kingsabbey sailed off course and cut through Southend Pier between the old and new Pier Heads. Roger was asked by Southend Council if he would store the surviving massive timbers made of Greenheart because they sink in water. They are piled up at Quay Farm to this day, only to supply anybody who needs to replace the odd rotting timber or two. Football Club and hosted a successful Rock & Roll Night with over 650 guests who consumed 1688 pints of lager and bitter. We went into his large barn where he stores some of his grain and bales of hay, which were stacked up ready to be shipped off to Holland and Algiers. More noticeable were his large toys, a Combine Harvester next to large state of the art tractor along with other heavy machinery such as the Fertiliser Spreader. Much more of this heavy machinery including a Bale Grab machine, and Concrete Crusher, Concrete Mixer, generators and pumps adorn his farmyard and other barns. Outside the large barn stands an old granary and the concrete moulds which are used to make concrete blocks. He took us into his office and quite noticeable to me were some pictures on the walls which were painted by Ron Clapp, who lived next door to me in North Street, Great Wakering, until he died. His style is quite unique and his paintings of local scenes are well known throughout the local villages. There are many other pictures and photographs on the walls, including one taken of the two bridges over Havengore before the old one was demolished. We then went through the barn to his white weather boarded house and Roger explained that the east facing side of the house shown above is dated 1633 and the west facing side 1976. There used to be a house at the back, which was the workers’ quarters, with a passage-way through to the kitchen. Roger built and recladded the west facing side of the building at a material cost of £22,000, taking 5 months of his life. The kerbstones between the house and barn were from Porters Grange, when they cut through the underpass, and from the front of the Kursaal. Roger is Lifetime President of Great Wakering Rovers Football Club at Burroughs Park, Little Wakering Hall Lane, Great Wakering, Essex. Burroughs Park was constructed in 1985 on the site of 104 disused allotments which the local council gave to the club. Roger is a former player (age 14 to 24) and Burroughs Park was named after him in recognition of his assistance to the club. The ground has floodlights and also boasts a clubhouse and tea bar. The highest attendance ever recorded was 1,150 for a pre-season friendly against Southend United in 2006. The club was formed in 1919 by soldiers demobbed after World War I and finding employment in the local brickfields. They first played in the Southend & District League, where they played until 1982, being the league's most dominant club, especially in the 1960s and 1970s. In 1982 they switched to the newly formed Southend & District Alliance Football League, but this league folded in 1989. At this point the club decided to make the step up to intermediate level and join the Essex Intermediate League. The year 2019 marks the 100 year anniversary of Great Wakering Rovers Football Club and Roger has plans to celebrate that year in style. Roger was President of The Rochford Hundred Agricultural Society in 1995, the same year as its fiftieth anniversary. For many years now he been involved in the organisation of local Ploughing Matches and two of these matches in 1984 and 1995 can be seen on YouTube, both hosted at Tree Farm, Foulness Island, Essex. Roger was President of the Essex Young Farmers in 2001 and 2002. They are a youth organisation made up of 16-26 year olds and, despite the name, you don’t have to be a farmer to join; absolutely anyone can be a member! Essex Young Farmers is run by its members, for its members, so everyone has the chance to have a say in what goes on. With 10 clubs across the county there really is something for everyone, be it organising events, playing sports, fundraising for charities or simply enjoying the social side of it all! I have only touched upon some of Roger’s activities through the years and hope at some time in the future to have the opportunity to interview him further.